HMS Albion naval ship "entered the territorial waters of China's Xisha Islands without the permission of the Chinese government," says China's foreign ministry spokesperson. China lashed out at Britain on Thursday for sending a warship close to disputed islands in the South China Sea, where Beijing has built military installations despite competing claims from other nations. The US and its allies have in recent times sent planes and warships to the area for "freedom of navigation" operations intended as a signal to Beijing of their right -- claimed under international law -- to pass through the contested waters. China's foreign ministry said the HMS Albion naval ship entered the area on August 31, sailing close to the Paracel Island chain, known as Xisha in Chinese. The vessel "entered the territorial waters of China's Xisha Islands without the permission of the Chinese government," a foreign ministry spokesperson said in a statement to AFP. "The Chinese Navy verified and identified the warship according to law and warned it to leave." The foreign ministry has lodged a protest "expressing strong dissatisfaction", the statement continued. "China strongly urges Britain to stop such provocations immediately so as not to damage the overall situation of bilateral relations and regional peace and stability." Beijing has deployed a range of military hardware including anti-ship missiles, surface-to-air missiles and electronic jammers across the South China Sea, where it has built islets and other maritime features into hardened military facilities, according to US officials. 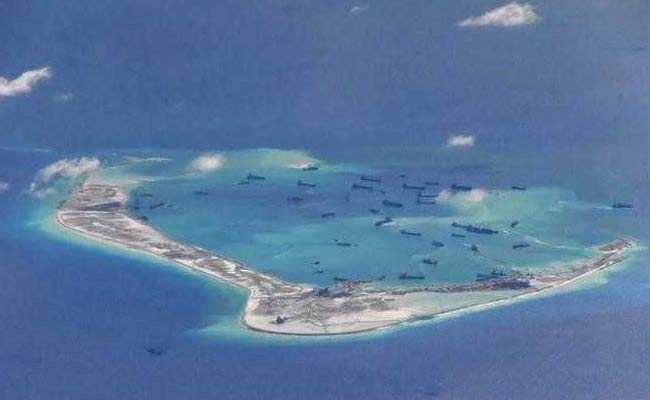 In May, China landed heavy bombers on Woody Island in the Paracels, a show of military might intended to boost its territorial claims in the area. Woody Island is home to China's largest base in the island chain, which are also claimed by Vietnam and Taiwan. Beijing claims most of the resource-rich sea, through which $5 trillion in shipping trade passes annually, with competing claims from Brunei, Malaysia, the Philippines, Taiwan and Vietnam.